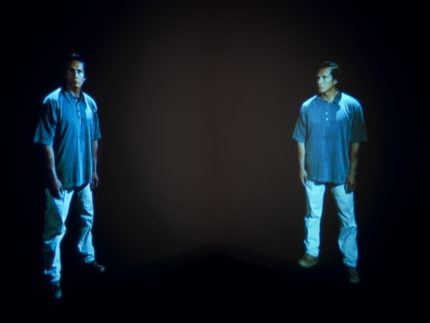 “Moving Pictures,” Real Art Ways (RAW), Hartford, Connecticut, February 27 – May 14, 2000. 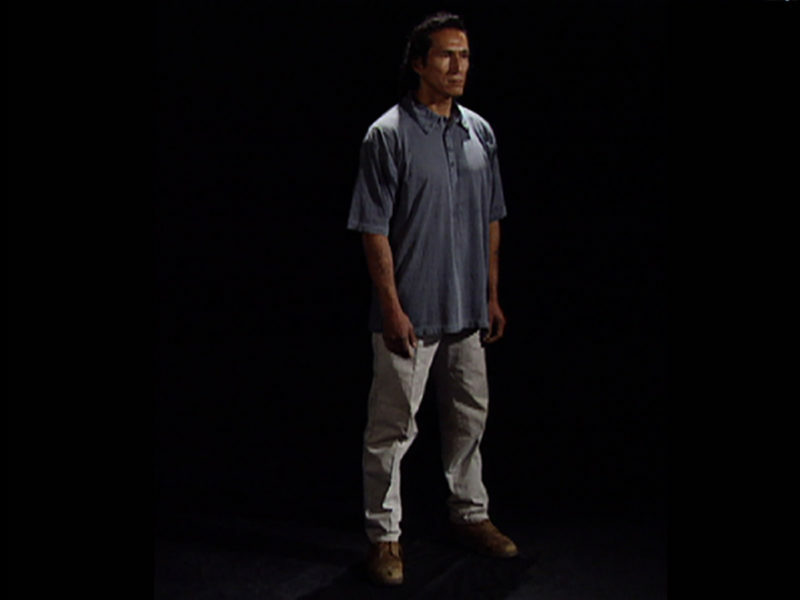 Note: As of 2000, the work has not been exhibited independently, and the following exhibition history reflects the exhibitions of Standing Apart/Facing Faces as a combined work. Pichler, Catherin, ed. Engel, Engel. Vienna: Kunsthalle Wien, 1997, pp. 132 – 141, 260. Dantas, Marcello. Gary Hill: O lugar do outro/where the other takes place. Rio de Janeiro: Magnetoscópio, 1997, pp. 6, 9, 45, 48, 66 – 68. Quasha, George and Charles Stein. Viewer. Gary Hill’s Projective Installations 3. Barrytown, New York: Station Hill Arts, 1997, pp. 7, 9 – 11, 29 – 56, 95. Quasha, George and Charles Stein. La performance elle-même in Gary Hill: Around & About: A Performative View. Paris: Éditions du Regard, 2001, pp. 15, 20, 25 – 26, 61, 73, 79, 92. Mauron, Véronique. Le signe incarné: ombres et reflets dans l’art contemporain. Paris: Éditions Hazan, 2001, pp. 205, 208, 220, 266. Quasha, George and Charles Stein. An Art of Limina: Gary Hill’s Works and Writings. Barcelona: Ediciones Polígrafa, 2009, pp. 37, 235, 238, 244, 248 – 251, 257 – 259, 271, 273, 345, 437, 444, 470, 486, 488, 495, 515, 571, 578, 584, 593.